In the world-class enterprise concepts and words like role, position, function, job, job description, task, department, superior, supervisor, controller, superintendent and many others have gone completely out of fashion or are rapidly becoming obsolete. In the world-class enterprise the focus is on processes. The new, associated terminology (replacing the obsolete one) includes concepts and words like core process, critical process, support process, process description, process owner, process output, process input, process efficiency, process effectiveness, team, coach and several others. So, what is a process and why is it so important? Simply put, a process is nothing else than a sequence of activities (A, B, C, D....), normally (but not necessarily) in series the one to the other, having a well defined input and a well defined output. A process is the mode in which the enterprise acts to produce products and services. For instance, the process that outputs an assembled pen (an ordinary ball-point pen), has a number of components as inputs: the pen plastic body, the refill, the top plastic plug and the plastic cap. Other inputs of this process include: instructions and directives, tools and assembly facilities, services and logistics (assembly table - containers for components - containers for assembled pens - adequate lighting - etc.). The assembly process (assuming it is fully manual) consists in a sequence of 3 activities: fit the refill to the plastic body - fit the top plug to the body - fit the pen cap on the writing side. Each activity may consist of and be sub-divided into a number of micro-activities such as: pick-up plastic body - pick-up refill - position body and refill ready for insertion - insert refill into body - pick-up plug - etc. There is always a process or a number of processes to produce a product or part of it. There is always a process or a number of processes to produce the object of a project. There is always a process or a number of processes to produce a service. Processes always exist, even when they seem to be invisible. In many old-world enterprises nobody is even conscious of the existence of processes within the enterprise, still they are there. Inputs may be provided by the upstream supplier or be inherent in the process. Inputs may be material (hardware....) or immaterial (information....). The output is supposed to be of value to the client. The output may be material (hardware...) or immaterial (information, image, service....). Every process has an efficiency parameter, index of the process' productivity. Every process has an effectiveness parameter, index of the process output quality. Processes may be "in cascade" the one to the other. 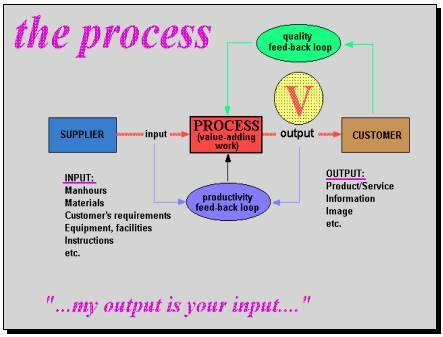 The output of a process may well be part of the input to the downstream process. Processes may also take place "in parallel". An overall process may consist of a number of series processes and a number of parallel processes. According to world-class criteria, a process should always generate abundant value for the process' customer, final judge of the overall process' performance. Process Engineering is the discipline that takes care of designing processes featuring high output value. Process Engineering is a modern development of the well known PIM - Process Improvement & Management discipline.